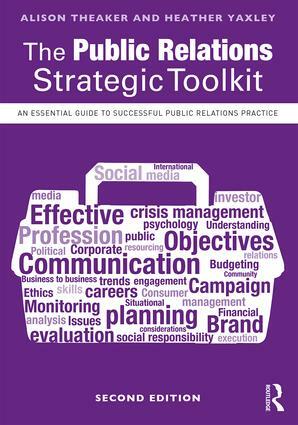 The Public Relations Strategic Toolkit presents guidance to instruct and educate students and professionals of public relations and corporate communications. Alison Theaker and Heather Yaxley cover every aspect of critical practice, including definitions of public relations, key theoretical concepts and both original and established methodological approaches. Case studies and interviews are featured to provide real-world context and advice for professional development. The new edition is fully revised with brand new case studies and updated content which reflect significant developments in theory and contemporary practice. It puts particular emphasis on the use of technology (including automation) and social media in current public relations planning, corporate communications and stakeholder engagement. By combining theory and practice, with an invaluable insight from experts in the field, this guide will introduce readers to all the professional skills needed for a career in public relations. Alison Theaker has over 30 years’ experience in public relations as a practitioner, academic and author. She has taught public relations, marketing communications and management in the UK and US. She is the editor of bestselling textbook, The Public Relations Handbook. A Fellow of the Chartered Institute of Public Relations (CIPR), she now runs her own business coaching and training consultancy, The Spark, as well as continuing to teach at undergraduate and postgraduate level for Birmingham City University and Plymouth University, UK. Heather Yaxley is a is a rhizomatic academic-educator-consultant-practitioner with a range of interests across public relations, reflective practice and sustainable professional development. She is a CIPR Fellow and Accredited Practitioner, as well as an honorary member and director of the Motor Industry Public Affairs Association Ltd. In 2017, Heather completed her PhD at Bournemouth University researching career strategies within public relations. She is an experienced university lecturer, a course director for the CIPR qualifications with PR Academy and her academic work has been extensively published. Heather works closely with a number of clients having established Applause Consultancy in 2000. She blogs at PR Conversations and participates in social media under the name Greenbanana.